Somewhat foreshortened weekend, leaving on Friday morning rather than Thursday night. 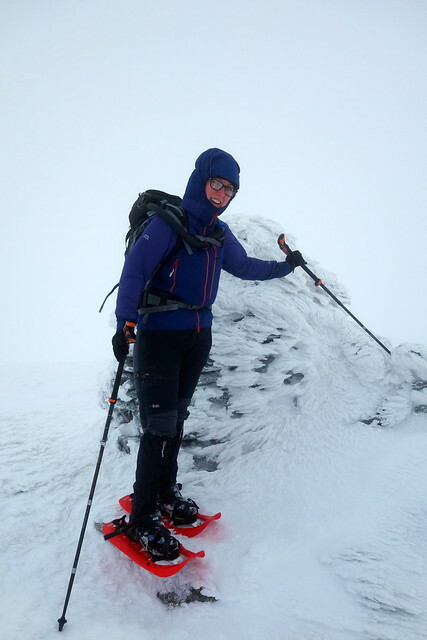 Snow and winds seemed a bit less problematic in the East, so the plan was to visit the Monadhliath on Fri & Sat and tick off a Top on A'Bhuidheanach Bheag for Allison on the way home on Sunday. 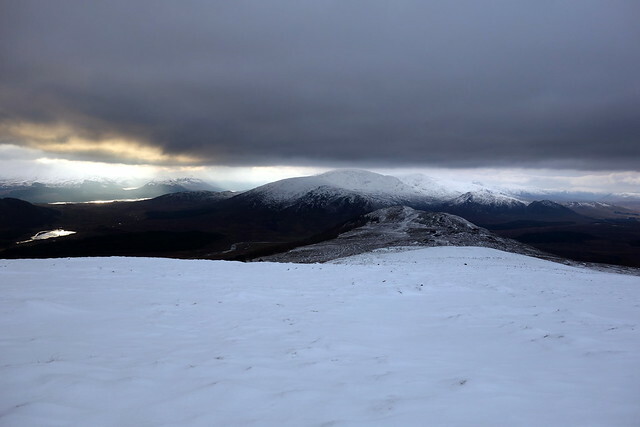 Quite nice driving up from darkness into light, rather than the other way round - we arrived at Garva Bridge before 10am and got ready for Geal Charn - I had decided to tag on a couple of Sims and make it into a horseshoe route rather than a there-and-back. 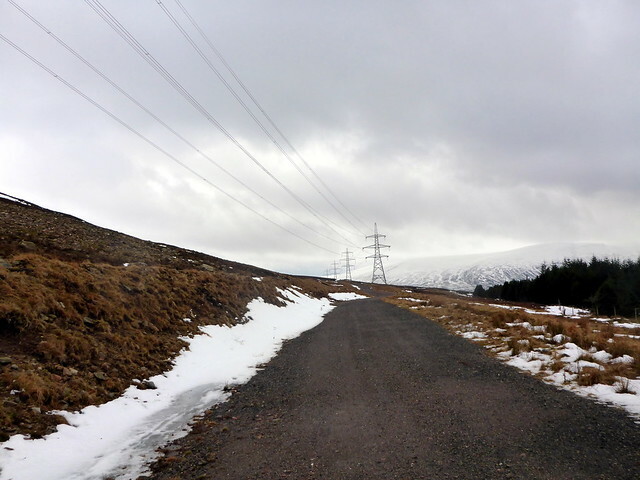 Road along by the reservoir was fine, no snow/ice - I was surprised by the absence of snow at ground level whilst driving thru Drumochter. First thing we noticed about the route was the appearance of a new bridge across the river - or maybe it was there 5 years ago and we missed it Anyway it was a good thing. 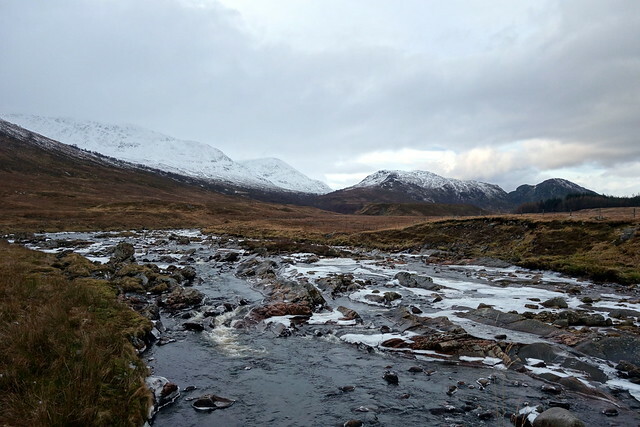 The path alongside the river, notoriously boggy was frozen solid and now notoriously slippy. We took care. 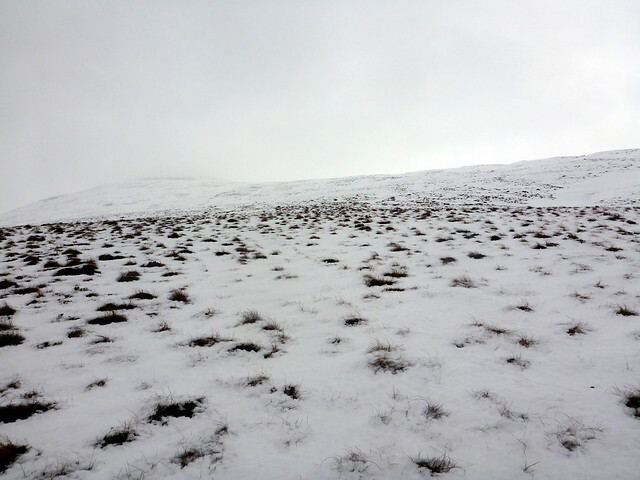 Most of the snow had been wind-blasted off Geal Charn - we made our way over heathery tussocks with occasional snow patches. 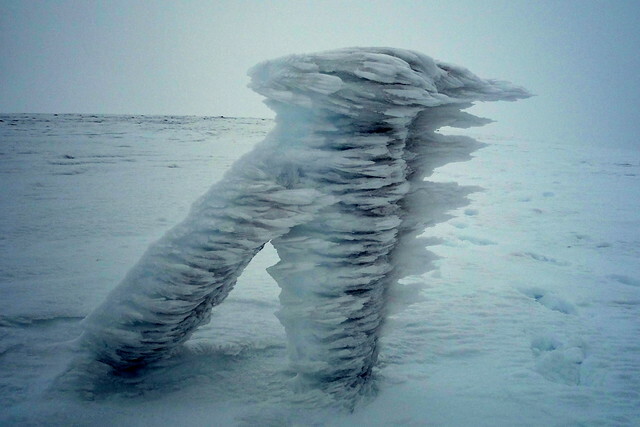 The wind was fierce and chill - this was a theme of the weekend. 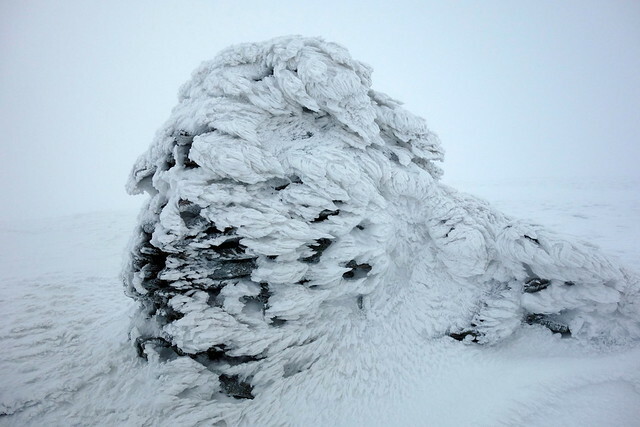 Arrived at the cairn - all decorated with icy feathers - just under 3 hours after setting off. 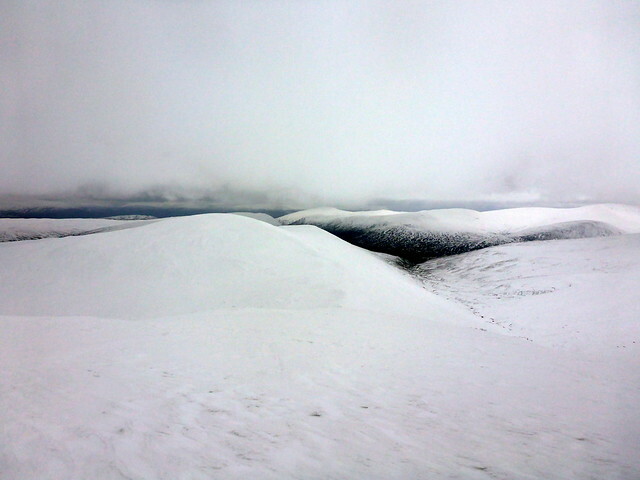 From here we dropped down south-east to Beinn Sgiath which held much more snow than the Munro. 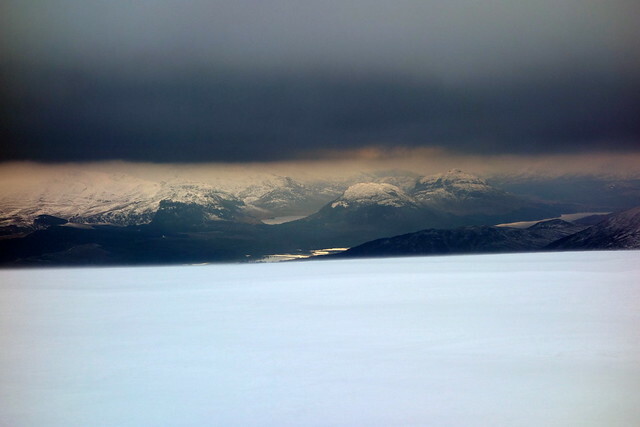 Heavy clouds created a "letterbox" effect framing the hills over Loch Laggan. 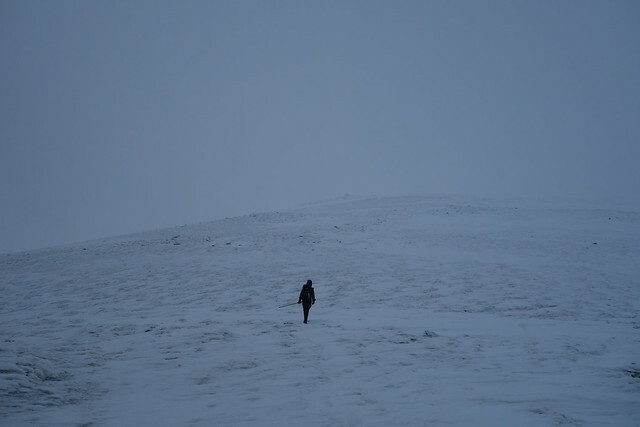 We wandered down the shoulder of the hill, regretful we'd left the snowshoes in the car, disturbing a few mountain hares, heading for Meall an Domhnaich, a second Sim. From here a steep descent through trees brought us back out onto the track and back to the car by around 3.30. 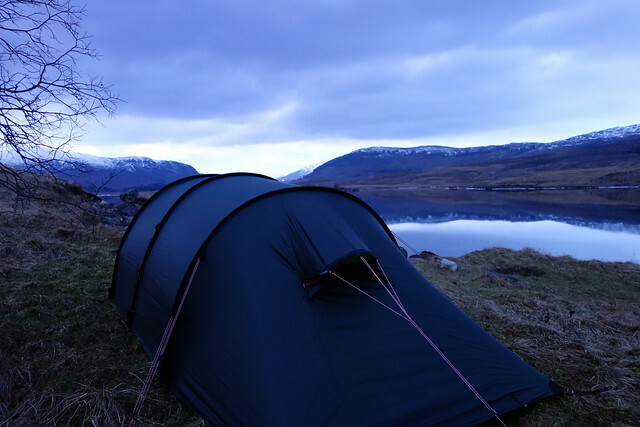 We drove a few miles back along the road to a camp spot we've used before on the lochside. The loch was frozen over, with a thin layer of liquid water on top of the ice. 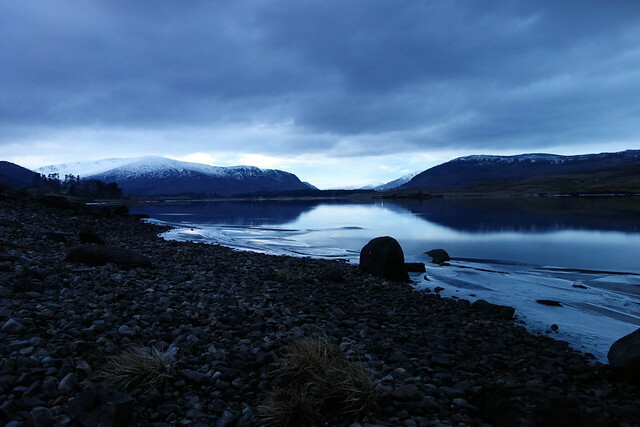 Around the shore, plates of ice moved with a grating, hollow sound as if the loch itself was breathing. We put the tea on and had an undisturbed night. Crossing the river was alright as the water level was quite low - we then ascended by the faint outline of an ATV track up the hillside, entering clag at around 700m. 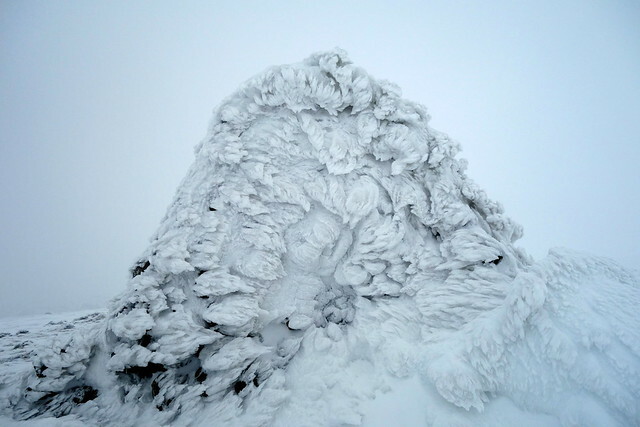 Up to the ice-decorated cairn then dropping down to cross Allt Cuil na Cailleach which was hidden under deep snow. I remembered a steepish ascent up the other side but it was much more gradual, little to see in the clag. 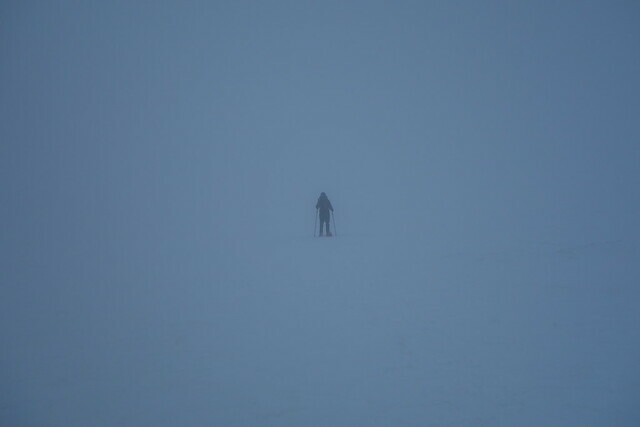 We came to a line of fence-posts and followed this to the summit of Carn Sgulain, arriving around 12.15. Lunch in a tiny bit of shelter behind the cairn and a decision to make. 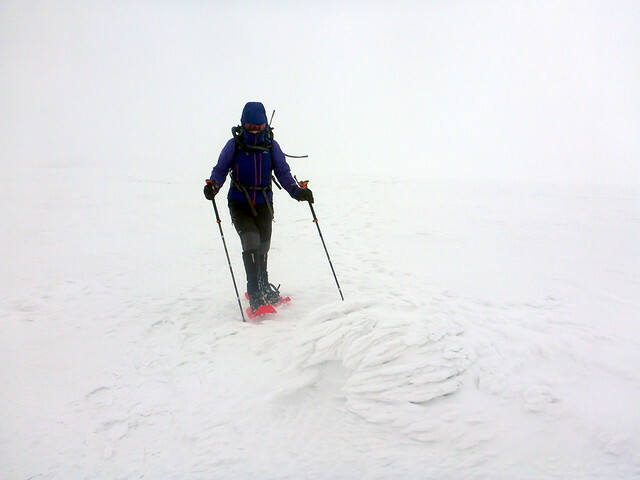 We opted to go on, thinking that we had ample time and only a plateau to follow round to Carn Dearg. Off we set, following the fenceline in the clag. 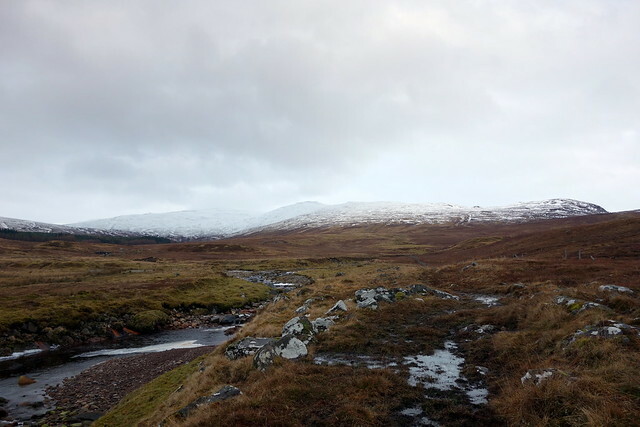 Just before Carn Ballach we met the other pair - I reckoned they were about 1.5km beyond halfway and we were yet to reach it - we were each glad of the others' tracks to follow. Wind was right in our faces, freezing my eyeballs if I took my goggles off. 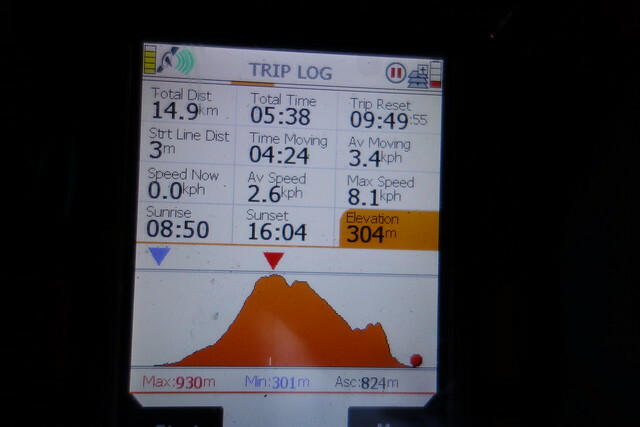 I'd reckoned on reaching Carn Dearg by 3pm which would mean that we'd be down to the track by the time the light failed. 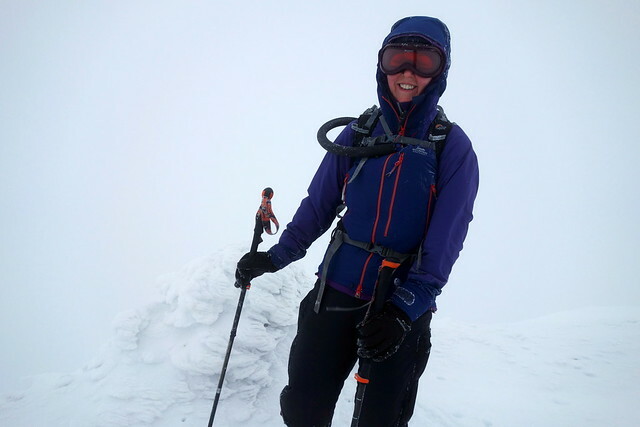 However Allison was finding the snow and wind oppressive and was struggling with some of the sections - I was concerned that it was 3.45 when we summited. 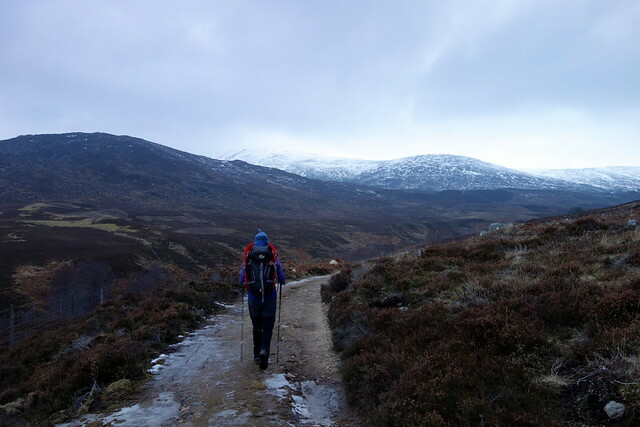 Having the other lads' tracks down into Gleann Ballach was very helpful, although they took a high line on the eastern side of the glen which meant more ascent for us. 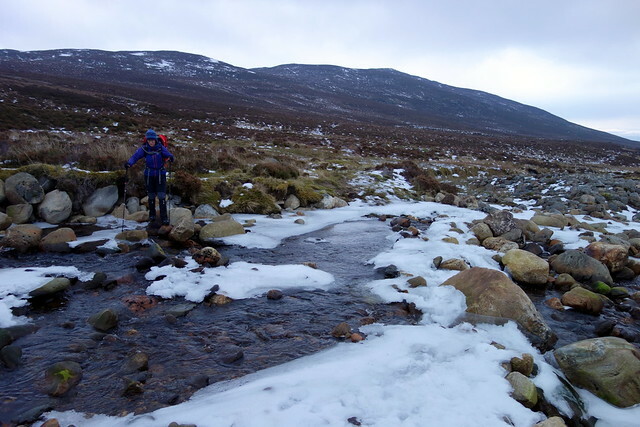 We got a little lost in the clag as the light died and took a higher line than the track down to the crossing of the Allt Fionndrigh which meant we couldn't see a bridge - Allison was sure we'd crossed on one last time, but it was too dark to find - and the river was shallow. Finally we got onto the track following the river south - icy in places meaning that walking pace was reduced. No moon meant a very dark night, other than a faint glow away over Newtonmore. We got back to the car park at 6.40, time to pitch the tent where we were. 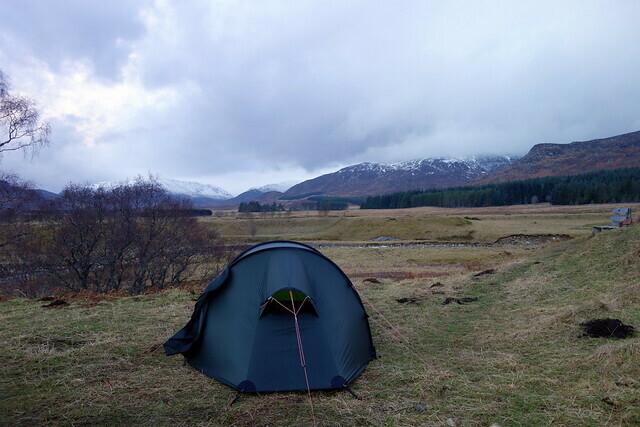 A large motor home had parked near the car - clearly unhappy with our arrival they up and left within 30 mins of our pitching the tent - not that we minded A three course meal helped soothe the long hours of walking although neither of us slept very well, surprisingly. Sunday brought a milder morning - as we emerged from bed a couple of cars of walkers drew up. We had a slow-paced breakfast before driving down the road towards Dalwhinnie to take on the Top of Glas Mheall Mor. I'd routed us up the hillside straight to Glas Mheall Mor from the road, returning via A'Bhuidheanach Bheag, although in the end this wasn't the route we took...parked up at Layby 80, so the car would be near at the end of the walk (or not, as it turned out) and set off along the old military road that runs alongside the A9. As we looked at the hillside it looked steep and white - I decided we'd be better cutting up onto Fuar Monaidh and doing A'Bhuidhenach Bheag first. 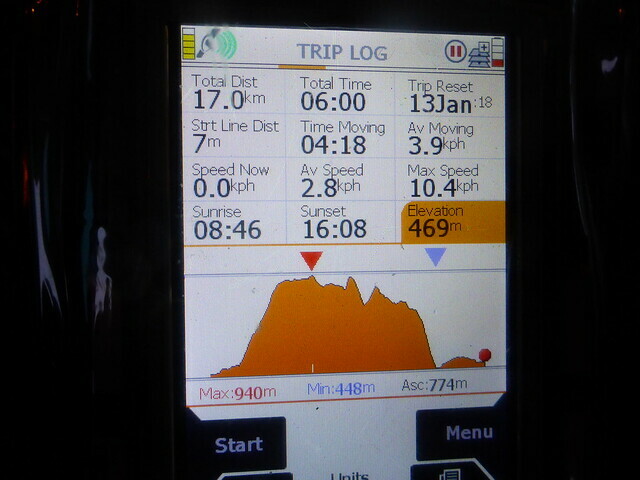 Not sure if this was really a good idea, although it did give a more gentle ascent that the proposed route. 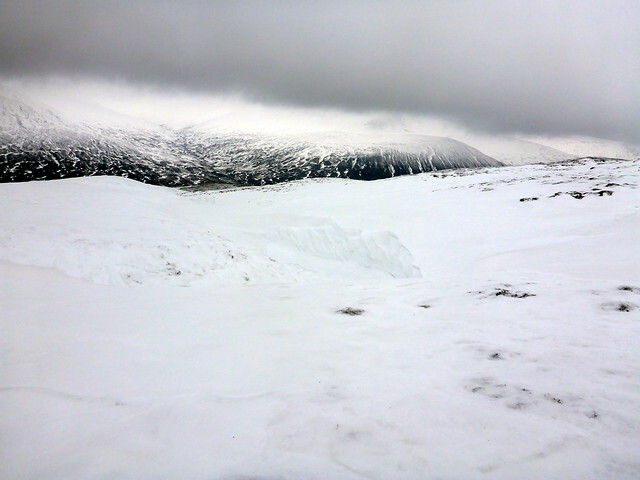 Some of the snow drifts were very thick - easily 15 feet in places. 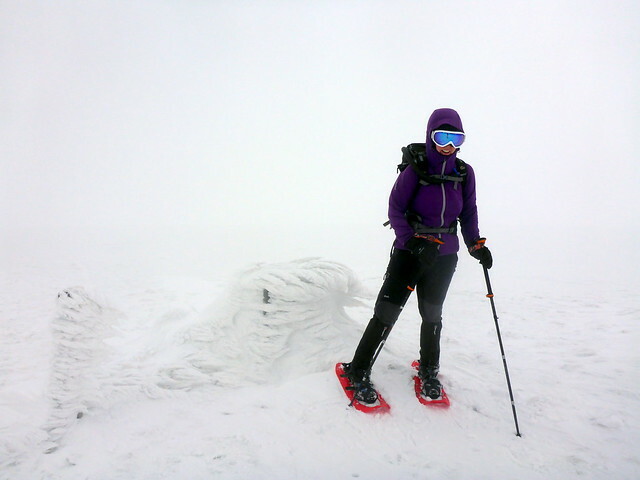 Snowshoes were a considerable boon again.  We got onto the plateau that led to A'Bhuidhenach Bheag - total whiteout. I found it disorientating to have nothing to fix on and wandered about a bit finding the right line - the very strong wind didn't help much either. 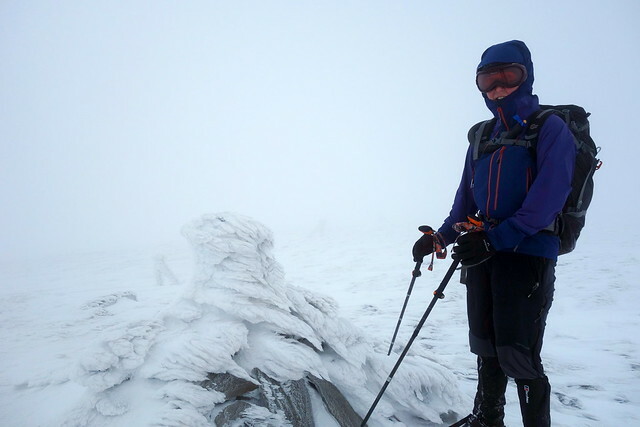 As we reached the half-buried trig point I asked Allison to get map and compass out and take bearings to Glas Mheall Mor. Fortunately, after a little while, there were clear ATV tracks to follow, which actually went right to the summit. 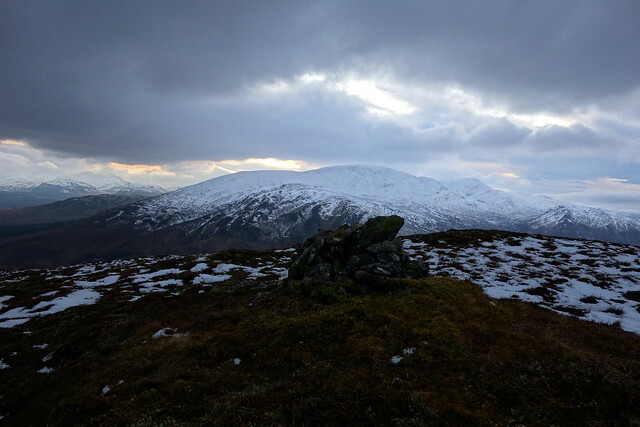 We snatched a late lunch in the blisteringly cold wind by the cairn and decided we'd go down the shoulder from here rather than retrace our steps. Only thing wrong with that was having to ascend 100 snowy metres up Glas Mheall Beag That accomplished we followed the ATV tracks down the shoulder and returned to the A9, taking the military road back to the car. 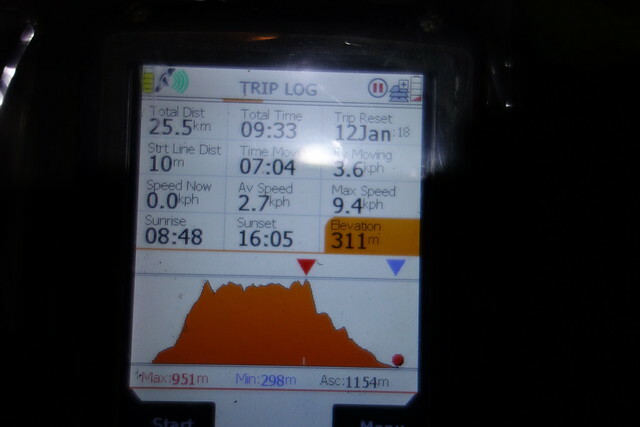 Not a great weekend for pictures, thanks to the clag, but a reasonable haul of hills nonetheless.